Quick! Name two monsters from Sesame Street! Okay, now name two female monsters from Sesame Street. Those of you who can name them probably watch as much of The Street as I do (minimum one hour a day, every day. I know, I know. I’m probably rotting my kid’s brain or her teeth or something). And even then, it’s not that easy. Zoe and Rosita (and Abby if we’re really stretching the definition of “monster”) are the female monsters who have appeared the most frequently in the past few seasons. There’s strike number one. Most of the monsters are male monsters. There are so many male monsters that they even end up discussing their crises of masculinity*! Elmo is just hanging out in all of his naked glory. Zoe, on the other hand, is wearing two barrettes (pink and purple, natch), a pink necklace, and a goddamn pink tutu. Rosita isn’t nearly as crass with her accoutrements, but she’s still stuck wearing a bow in her hair. Because, you know, girl. So, what does this all matter? Why do I care if a fictional character that isn’t even human has a hair clip, or pointe shoes, or a huge pink glittery sandwich sign that says “ASK ME ABOUT BEING A GIRL”? I have no problems with femininity or feminine characters, but I do have a big freaking problem with male being the default. For all the good that it does, Sesame Street is reinforcing the concept that maleness is the norm and femaleness is the aberration. It is also teaching kids that women and girls are meant to be adorned and cannot just be. The solution is pretty easy, though: take the bow out of Rosita’s hair and the next time a female monster is introduced, allow her to be plain, just like the male monsters. Allow her to define herself by her likes and desires and not how she chooses to decorate herself. Sesame Street is a show of firsts. Gordon was one of the first Black role models for kids. Sesame Street was one of the first (and perhaps only) show to compassionately teach children about death and grieving. Sesame Street teaches us that we’re all different without resorting to tokens. It’s a brilliant show; now let’s see it tackle gender in a meaningful way. *Shorter the linked clip: Baby Bear (aka The Most Annoying Muppet in the Universe) loves his dolly. But what if Telly finds out? Don’t worry, Gordon is to the rescue! This is all played out while Baby Bear’s little sister (Curly Bear) watches dumbly from the background. God, I wish I was joking about that. Unfortunately, the way that male characters are the default and females are the males w/ bows or pink accessories is common. Anita Sarkeesian talked about how it happens in video games (think Ms. Pac Man) in her Ms. Male Character video (http://www.youtube.com/watch?v=eYqYLfm1rWA). It’s part of her series on tropes against women in video games. Right on, Alexandra. Bugs me that I had’t noticed it before. This is a little disturbing. Why not introduce just another character who loves ballet rather than turning Zoe into the ballet loving monster to appease the masses. Side note: I think all the monsters at the flying fairy school are wearing clothes, although not all those monsters are featured on the street at Sesame St. So she isn’t the only one dressed up one at the flying fairy school. They are all dressed monsters to varying degrees. Another side note: I wouldn’t expect that Curly would interact/add in the scene. Baby Bear is already quite young and that would make his sister even younger and likely not joining in group play or complex conversations. But I understand what you are saying here. Rosita is mostly naked minus the greenish/yellow bow. Nice try, but it does by default mean you are not a girl unless adorned in some wholly feminine way. Wearing greenish/yellow as your choice of bow does not count. My issue with Curly bear is that she *can* talk (there have been entire skits dedicated to pointing this out) but they chose to stick her in the background and gape at her brother. I wonder hkw many girls are actually “obsessed with ballet” and for those who are, how many of those wear their ballet gear 24/7. It just seems to be an excuse for Zoe to wear pink (especially considering that her real passion is her pet rock Rocko). And you’re totally right, all the fairies wear clothes (though not always pants). Can’t speak for others, but my 4 year old is very interested in ballet and has been since she was 2 and a half. I’ve encouraged this interest by enrolling her in pre-ballet and creative movement classes, showing her lots of live and video performances of real ballet, buying her leotards, tights, tutus and proper ballet slippers, and playing music that she was dance to at home. That way it’s about a real art form and really doing something, not just a pretty image. She does often wear her leotards and tututs around the house on weekends, but she knows it is not appropriate to wear to school or out, because it is special clothing that costs extra and is meant to be used for a specific activity. Thankfully she’s never asked me why Zoe is allowed to wear her tutu everywhere. Does she talk? Sorry, I didn’t think that she talked much, but I may be out of the loop. I don’t mean to derail. I thought she was playing the scene to toddler nature. She does indeed! My favorite example is from the skit for “Bye Bye Binky” where Curly Bear decides to give up her pacifier because no one can understand what she’s saying. I hate that justification for the tutu. Many boys are obsessed with [insert interest here], yet somehow Elmo doesn’t have to directly represent them and can just be an annoying little fuzzbucket. Yes, exactly! I mean, we know that Telly has a weird thing for triangles, and yet he’s not forced to wear them every day. It’s almost as if he’s not wholly defined by one thing. I haven’t seen Sesame Street in decades. I don’t think there were any female monsters at all when I last watched it. LIke chigau, I haven’t seen Sesame Street in at least 25 years. I can’t remember any female monsters at all from those days. The you-can-tell-they’re-female-because-accessories business has always infuriated me. Here’s hoping the people who make Sesame Street figure out why that’s a problem in the near future. I can just about remember female monsters on The Street (thanks for that great nickname, Alexandra). Back in the day, I was just so grateful that it wasn’t the smurfs, that it seemed brilliant. Good to see there is some feedback to try to keep them on the leading edge for our kids. Nice post. Baby Bear always bothered me as a Sesame Street character. Because he’s straight out of a fairy tale, his character is already constrained by that story, so the writers are not free to develop him the way they are with all the other monsters. I don’t think he was a good idea. Prairie Dawn merits a mention here, even though she’s not a monster, because at least she’s a female Muppet. I wish she weren’t such a classic girly goodie-two-shoes all the time, though, she needs to let loose a little. But I haven’t seen the show in some years, so maybe they’ve let her misbehave a little. And my other main thought about Sesame Street is that they have totally undermined Cookie Monster. He’s been seen saying that “cookies are a sometime food” and eating vegetables! That’s just wrong! Cookie Monster needs to be the unbridled Id of the show, the spirit of “gimme” that kids understand. He should never have self-control on his own, the fun with his character is in others trying to impose control on this force of pure hunger. It might just be a “male writers being reluctant to write for female characters for fear they’ll screw it up” thing. I believe this is partly why some of my other childhood favorites, Asimov and Tolkein, had so few women in their worlds. So I’m inclined to cut creators some slack when their portrayals of women are a litle off, I guess. 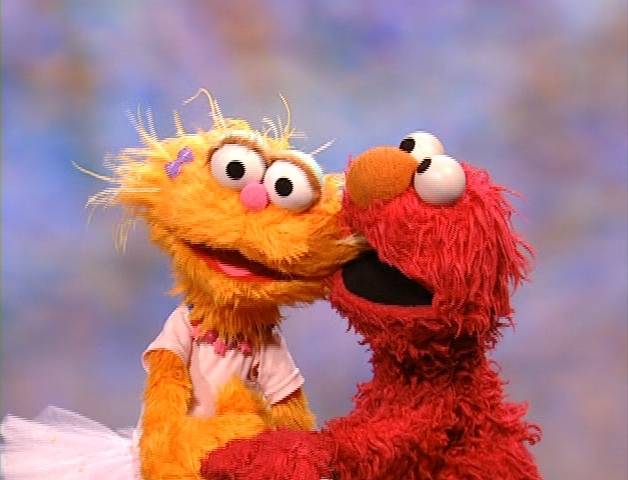 I wouldn’t want the Muppeteers to be afraid to introduce Zoe in the first place for fear of backlash about her tutu. But what I really want to know is, does Sesame Street pass the Bechdel test? I totally agree and it bugs me too. Sometimes Elmo dresses up in accessories or clothes if he’s doing something specific. So why is Zoe always wearing her ballet dress and tutu even when she’s not actually dancing ballet? Argh. Part of the problem is that it’s possible that without the superficial accessories of femaleness, kids might not even realize a naked monster puppet is supposed to be female. Blues Clues attempted to be progressive about gender identity with a female blue dog. But when I worked with preK students, I remembering hearing a conversation where some kids were arguing over whether “Blue” the dog was a girl or boy. Even though Blue is referred to on every show with female pronouns, many kids had just assumed Blue was male. And in college a feminist columnist criticizing the poor ratio of male/female characters in children’s shows listed “Blue the dog” as yet another male protagonist. It’s difficult and takes time to change the code.